Spending Summer at New Jersey?? Planning for a great vacation with the kids?? Well guess what!! If you looking for things to do in New Jersey check out Morey’s Piers because they are bringing in Radio Disney’s hottest musical artists live on their Magic Mondays events. This FREE concert was held last July 7th and 14th, and has another one coming this 21st of July. The shows are set on 1pm and 4pm slots. They will also have a grand finale on July 26 at 2pm (Saturday) at the Wildwoods Convention Center Oceanfront Arena. 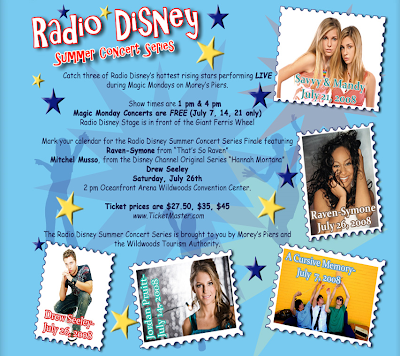 This event will mark the end of the Radio Disney Summer Concert Series. Expect live performances by Raven-Symone who starred with Martin Lawrence in Disney’s currently showing movie “College Road Trip” and Disney’s Channel’s “That’s so Raven” and by Mitchell Musso of “Hannah Montana Show” and many other Radio Disney artists. Tickets are very affordable at $27.50, $35 and $45 only. By the way, if watch the concert, on July 27 you can avail a choice of $10 off to an all-day waterpark ticket for either Ocean Oasis or Raging Waters or $10 off to an amusement pier wristband valid for 3 days at Morey’s Piers, or $15 off on a one-day splash and ride combination ticket!! Isn’t that a great deal?? So, if you are thinking of a New Jersey vacation, might as well check these Wildwood events out!! Your kids might get the fun time of their life this summer. Juan for Fun 2016 Backpacker Challenge is Now Accepting Entries!